You know you received an email with an attachment, but you are having a hard time finding it. Did you know you can search for emails with attachments. There are essentially two ways to accomplish this. First you can just type has:attachment in the search box. The second method is to enter the advanced search using the drop down on the right side of the search box. Once in the advance search screen, just put a check box next to has attachment. 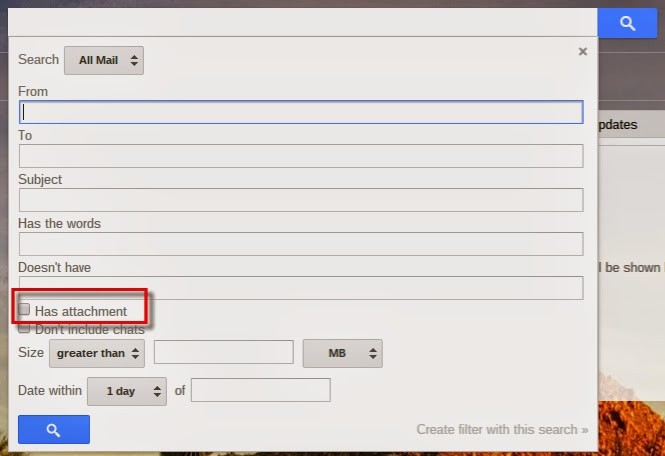 Searching for attachments will include calendar invites and emails that have images in their signatures as well. It should be noted that I have tested this in Inbox by Gmail as well and find the results to be the same as in classic Gmail; however there is no advanced search screen in Inbox by Gmail, so your only option here is to enter has:attachment in the search field.